A bad toilet means continual problems and low-level frustration. On the other hand, a good toilet means that life goes on as usual, with no aggravation and little thought given to the most basic of your home's facilities. The Kohler Highline Classic is an inexpensive and widely available toilet and is one of several toilets that you will regularly encounter unboxed and on display at Home Depot, among other home centers. In terms of providing basic functions at a low cost, with a moderately simple installation, the Highline Classic just might be what you are looking for. However, you will want to know about some of the Highline Classic's idiosyncratic features that make a product that is less than perfect. The Kohler Highline Classic is a two-piece elongated toilet available in white or biscuit colors. The two-piece part of Kohler's description means that this is a conventional toilet with a separate tank that you attach to the back. This is in contrast to a toilet that has been making its way into residences lately, the one-piece toilet. As the name describes, the latter is a toilet that is one single unit, tank seamlessly attached to the bowl. The Highline Classic is an elongated toilet, so the bowl is much longer but only slightly wider. Not only that, the elongated feature increases the total length of the toilet (from the back wall to the outer front edge of the toilet). This is something to keep in mind when installing the toilet in a small bathroom. On the whole, bathroom codes require a minimum of 21 inches of clearance between the front of the toilet and the closest obstruction, such as a wall, shower, or tub. Thirty inches of clearance provides an even more comfortable amount of space. Kohler advertises the Highline Classic as "The Complete Solution," the theory being that you can take the single box home and install the enclosed toilet without having to purchase any accessories. Tools are not included. This toilet runs 29-1/2 inches from the back wall to the farthest edge of the toilet. By contrast, a conventional toilet is about 28-1/2 inches long. If you currently have a regular sized toilet, you will notice the elongation and will probably appreciate it. Even though the elongation affords just one additional inch, it is an inch that counts for much. The Highline Classic's gallons per flush (GPF) rating is 1.28. This is the eco-friendly standard that you will find with nearly every toilet sold now at Home Depot. The Highline Classic's rim height is 16-1/2 inches and this represents a rim height that is increasingly becoming standard. Kohler calls this "chair-height" seating. When Kohler says that the Highline Classic is a "Complete Solution," they mean that, along with the tank and bowl, you receive a seat, lid, wax ring, and T-bolts. You would expect the first two items with many toilets, but the last two items are ones that you would normally purchase separately. It is worth noting, too, that some toilets do not come with the seat and lid. The flexible water supply line is not included with the Highline Classic, nor is this piece included with most other toilets. This is nearly always a separate purchase with any toilet, since lengths vary according to the specific owner's needs. The Highline Classic's seat and lid have an easy on/off operation. This means that the seat and lid have the ability to slide completely off to facilitate cleaning. There is no need to unscrew anything. If you have ever spent time trying to clean up around the hinge area and still not getting it clean, you may like this feature. Note that the two plastic bases for the bolts do remain after you slide off the seat/lid, so you still have those obstructions. The Kohler Highline Classic's installation process is moderately easy. If you have installed toilets before, the process is roughly the same as with any other toilet. Even so, the Highline Classic that was reviewed did have a number of issues that made installation more difficult than it should have been. On the plus side, the separate components are relatively light and easy to carry once they are out of the box. Items are well-organized and, except for one section of the process, the instructions are clear. Instructions are vague about attaching the tank to the bowl/base unit. The Kohler Highline Classic has gasketed bolts on the bottom of the tank which appear long enough to extend through the mounting holes on the toilet bowl. But in the way that the toilet is shipped, the bolts are not long enough. Instead, those gasketed bolts need to manually be forced back into the tank so that the tank can properly attach to the toilet bowl. Another issue is that the reviewed Highline Classic did not ship with the necessary hardware for attaching the seat to the bowl base, even though it was a factory-sealed box. Kohler refused to send replacement hardware, stating that the toilet would need to be uninstalled, cleaned, and returned to the place of purchase for an entire replacement. Finally, many toilets come with two sets of differently sized bolts for mounting the toilet to the closet flange. The Highline Classic, though, comes with only one set of long bolts, which may entail cutting off the ends of the bolts with a hacksaw or a multi-tool. The Kohler Highline Classic is one of the lowest cost name-brand toilets found at Home Depot. The toilets most comparable to the Highline Classic are Home Depot's long-standing bestsellers, Glacier Bay models N2316 or N2430E. However, because Glacier Bay is a house brand of Home Depot, prices on the Glacier Bay toilets are as much as 50-percent less. If you're a toilet owner who has to plan toilet flushing operations in multiple stages, you might be pleased to know that the Highline Classic does a fantastic job of flushing large loads of solids and paper in one flush. Even though it is a conventional gravity-fed toilet, it has enough power that it behaves almost like a pressure-assisted toilet. 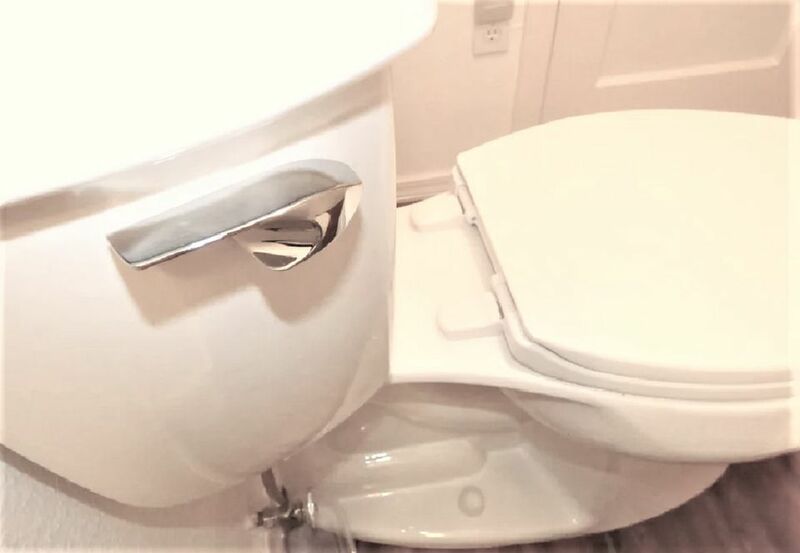 If you are a very slim person, or for children, the larger toilet seat (and thus a larger toilet opening) might be an uncomfortable fit, as the person using the toilet may not feel secure.